On 13th February, in Antananarivo, Madagascar the ESPA-funded p4ges (Can paying for global ecosystem services reduce poverty?) project delivered a training course in freely available policy-support tools for assessing baseline ecosystem services and the impacts of scenarios for management: WaterWorld and Co$ting Nature. The 25 trainees included staff from the Ministry of Water among other local government ministries, university departments and the Office National pour l’Environnment. Local and international conservation (WWF, Conservation International, WCS) and development-focused (WaterAid, EU-DEV) organisations were also represented in significant numbers. 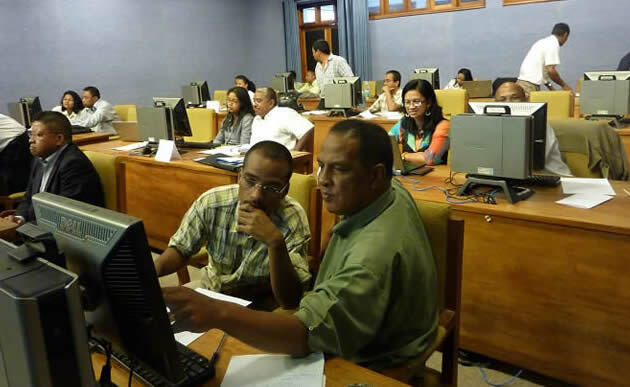 The training was introduced by Dr Luciano Andriamaro (head of science at Conservation International) and Dr Rija Ranaivoarison from the world bank WAVES programme. There was great interest in the tools, so much so that the planned 2 hours session ran to 3 hours and the participants all requested that we run further training to allow them to get deeper into the tools. Jean Roger Rakotoarijaona from the office national pour l’environnment (ONE) said ‘These sort of tools are very useful for us in planning further investment in REDD+ at the national scale. I will encourage my colleagues to attend further training and look into this in more detail’. 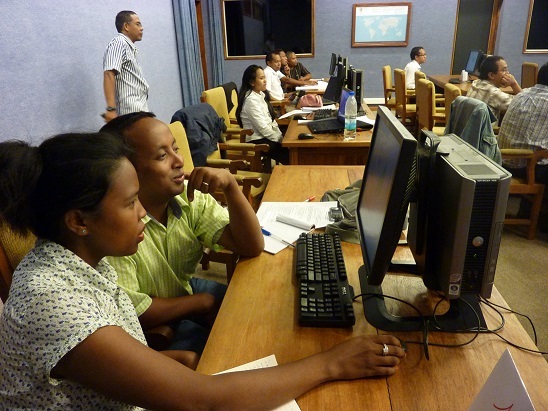 The training involved the participants running baseline analyses for northern Madagascar with Co$ting Nature as here and a baseline and land use change scenario using WaterWorld as here. The WaterWorld examined the potential impacts of a deforestation scenario on annual water flows in the country. 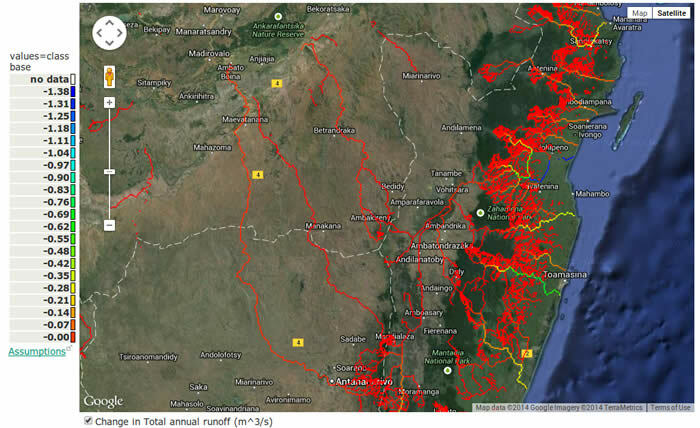 The image below shows areas in which such a scenario of continued forest loss outside of protected areas would lead to reductions in river water flows.